The Bobcat® utility vehicle operator training course imparts rules and practices for safe operation. It is NOT designed to license or certify operators as skilled or factory authorized operators. View an excerpt of the utility vehicle operator training course handbook. Get a preview of the video content in the utility vehicle training course. Discuss the features and important characteristics of the utility vehicle. Explain vehicle rated capacity, maximum occupant capacity, maximum cargo box load, maximum trailer tongue weight, and total rated capacity. Explain important issues of hauling loads in the cargo box or on the attachment arm (if equipped). Explain important issues of towing equipment with the utility vehicle. Explain the importance of using the seat belt for operator and passengers restraint and never to carry riders on the vehicle. Identify the controls and their functions. Identify the vehicle’s safety features and explain their importance. Explain the proper method for transporting the utility vehicle. 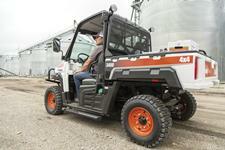 The Bobcat utility vehicle is designed for property maintenance, grounds keeping and landscaping. It has a cargo box for hauling loads and a receiver hitch for towing loads. Some models also include an attachment arm and front power take-off (PTO) for hauling loads or operating various attachments. The selectable drive mode feature allows the operator to choose between two-wheel drive and four-wheel drive. This feature allows the utility vehicle to work on different ground conditions, including mud and snow, while also being able to operate on work surfaces like turf and grass with minimal ground disturbance. Not only will it take you and a co-worker to the job site, it will also help you complete the job. Slow down when making a turn. Do not make sharp turns when you are carrying a load or when at high speeds. Do not overload (see Vehicle Load Capacity decal). Make sure the operator and the passengers wear the seat belts at all times when operating the utility vehicle. Keep arms and feet inside the vehicle while moving. Never carry riders on the vehicle.